In response to the question why we should preach Christ today, many might respond by pointing to the example of the apostles: If Peter and Paul preached Christ, then preachers today must preach Christ. But this argument from imitation is rather superficial and flawed. To imitate Paul in preaching Christ is rather selective imitation, for most of us do not imitate Paul in going on missionary journeys to do our preaching. Nor do we imitate Paul in going first to the synagogues to do our preaching. Nor do we imitate Paul in literally making tents to support a “tentmaking ministry.” In all these and other instances we realize that biblical description of what Paul was doing does not necessarily translate into biblical prescription for us today (Reading biblical description as biblical prescription is a common form of the genre mistake, i.e., reading the genre of historical or autobiographical narrative as if it were the genre of law or exhortation (See Sidney Greidanus. Modern Preacher, 17, 165). So we must dig deeper to make the case for preaching Christ today. What were the underlying reasons for Paul and the other apostles to preach Christ? And do these reasons still hold for preachers today? “Go … and make disciples of all nations, baptizing them in the name of the Father and of the Son and of the Holy Spirit, and teaching them to obey everything that I have commanded you. And remember, I am with you always, to the end of the age” (Matt 28:19-20). Although the baptismal formula is trinitarian, the command to make “disciples [of Jesus]” and to “teach … them to obey everything that I have commanded you,” and the promise of Jesus’ presence – all focus specifically on Jesus Christ. The apostle Peter later recalls, “He commanded us to preach to the people and to testify that he is the one ordained by God as judge of the living and the dead” (Acts 10:42). Even the apostle Paul, who did not receive the original mandate, would later receive the specific command to preach Christ. While he was on the way to Damascus to persecute Christians, the living Lord intercepted him: “I am Jesus, whom you are persecuting. But get up and enter the city, and you will be told what you are to do.” Then Jesus told Ananias to meet Paul, “for he is an instrument whom I have chosen to bring my name before the Gentiles and kings and before the people of Israel” (Acts 9:5-6, 15). Exciting News: The King Has Come! (2) In addition to obedience to Jesus’ mandate, another major reason for preaching Christ lies in the message itself. Even today when a President or a Queen visits a city, the arrival itself is a newsworthy event. No one needs to command broadcasters to tell the story, for the story itself begs to be told. If this is true for the arrival of a President or a Queen, how much more for the arrival of “the King of Kings.” After centuries of waiting for God’s promised Messiah, after many high expectations and more dashed hopes, the story of his arrival simply has to be proclaimed. For example, when Peter’s brother Andrew met Jesus, he found a natural outlet for his excitement: “The first thing Andrew did was to find his brother Simon and tell him, ‘We have found the Messiah’…. And he brought him to Jesus” (John 1:41-42, NIV). Andrew’s need to tell was but a small foretaste of the church’s missionary zeal after Jesus’ resurrection. This story simply has to be told: God has fulfilled his promises; his salvation has become a reality; the kingdom of God has broken into this world in a wonderful new way; the King has come! (3) Another major reason for preaching Christ lies in the life-saving character of the message. Jesus, and you will be saved, you and your household” (Acts 16:30-31). As Paul put it a few years later, “If you confess with your lips that Jesus is Lord and believe in your heart that God raised him from the dead, you will be saved” (Rom 10:9). Faith in Jesus Christ is the antidote for eternal death. In a world dead in sin, alienated from God, headed for death, the life-giving message of Jesus Christ is so urgent that it simply must be told. For it is a message of hope, of reconciliation, of peace with God, of healing, of restoration, of salvation, of eternal life. (4) A further stimulus for preaching Christ is that Christ is the only way of salvation. Eternal life is to be found only in Jesus Christ. If Jesus were one of many ways of salvation, the church could relax a bit, hoping that people might find some other way to be saved from death. But now that Christ is the only way, the urgency of preaching Christ is all the more pressing. There is salvation in no one else but Jesus (See, e.g., Allan Harman, “No Other Name,” Theological Forum 24. November, 1996, 43-53). All of the above reasons for preaching Christ hold today as much as they did in the times of the New Testament church, for Jesus’ command is valid “till the end of the age.” In a century which counts more Christian martyrs than in all of church history, the good news that the King has come is as significant and encouraging as ever; in a materialistic age in which people despair of the meaning of human life, the vital news that there is salvation from death through faith in Christ is as crucial as ever; and in our relativistic, pluralistic society with its many so-called saviors, the exclusive news that there is salvation in no one else but Jesus Christ is as essential as ever. Today, both in Christian worship (seeker sensitive, one would hope) and in seeker services, Christ needs to be preached. “One of the most fascinating of all the preacher’s tasks,” John Stott writes, “is to explore both the emptiness of fallen man and the fullness of Jesus Christ, in order then to demonstrate how he can fill our emptiness, lighten our darkness, enrich our poverty, and bring our human aspirations to fulfillment” (John Stott, Between Two Worlds. Grand Rapids: Eeerdmans, 1982, p. 154). For “to encounter Christ is to touch reality and experience transcendence. He gives us a sense of self-worth or personal significance, because he assures us of God’s love for us. He sets us free from guilt because he died for us, from the prison of our own self-centeredness by the power of his resurrection, and from paralyzing fear because he reigns…. He gives meaning to marriage and home, work and leisure, personhood and citizenship” (Ibid, p.
Committed Christians as well as non-Christians will benefit from explicitly Christ-centered preaching today. In a post-Christian culture such preaching will enable Christians to sense the centrality of Christ in their lives and in the world. It will help them to distinguish their specific faith from that of Judaism, Eastern religions, the new age movement, the health-and-wealth gospel, and other competing faiths. It will continually build their faith in Jesus, their Savior and Lord. Preaching Christ in a non-Christian culture sustains Christians as water sustains nomads in the desert. Reu claims, “Genuine Christian faith and life can exist only so long as it remains a daily appropriation of Christ” (Johann Michael Reu. Homiletics: A Manuel of the Theory and Practice of Preaching. Nabu Press, 2010, p. 57). Even those committed to Christ must continually learn and relearn what it means to serve Jesus their Savior as Lord of their life. Preaching in a post-Christian culture places a tremendous responsibility on contemporary preachers to preach Christ plainly, genuinely, and perceptively. Preachers can no longer assume that their hearers will discern the connections of the message with Christ in the context of a Christian mind-set and in the context of Christian worship. These connections need to be intentionally exposed for all to see. John Stott brings the goal into focus for contemporary preachers: “The main objective of preaching is to expound Scripture so faithfully and relevantly that Jesus Christ is perceived in all his adequacy to meet human need” (Stott, Between Two Worlds, p. 325) William Hull adds this sound advice, “Let us not mount the pulpit to debate peripheral questions or to speculate on esoteric curiosities. . . . We are there to preach Jesus Christ as Lord…. That is our awesome assignment: to put into words, in such a way that our hearers will put into deeds, the new day that is ours in Jesus Christ our Lord” (William E. Hull, “Called to Preach.” In Heralds to a New Age. Ed. Don M. Aycock. Elgin, IL. : Brethren, 1985. pp. 47-48). The article above is adapted from Sidney Greidanus. 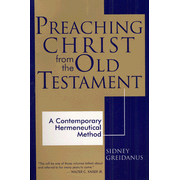 Preaching Christ from the Old Testament: A Contemporary Hermeneutical Method. Grand Rapids: Erredmans, 1999. Kindle Locations 4499-4500. About the Author: Sidney Greidanus received his B.A. from Calvin College in Grand Rapids, MI, his B.D. from Calvin Theological Seminary, also in Grand Rapids, and his Th.D. from the Free University in Amsterdam, The Netherlands. His dissertation, Sola Scriptura: Problems and Principles in Preaching Historical Texts, was first published in 1970 and reprinted in 1979. Since returning to North America, he served as pastor of two Christian Reformed Churches in Canada, taught at Calvin College in Grand Rapids, MI, The King’s College in Edmonton, AB, Canada, and since 1990 has been professor of preaching at Calvin Theological Seminary. Preaching Christ from Daniel: Foundations for Expository Sermons. Grand Rapids: Eerdmans, 2012. Preaching Christ from Ecclesiastes: Foundations for Expository Sermons. Grand Rapids: Eerdmans, 2010. Preaching Christ from Genesis: Foundations for Expository Sermons. Grand Rapids: Eerdmans, 2007. Sola Scriptura: Problems and Principles in Preaching Historical Texts. Wipf & Stock Publishers, 2001. Preaching Christ from the Old Testament: A Contemporary Hermeneutical Method. Grand Rapids: Eerdmans, 1999. (from which the article above is adapted). The Modern Preacher and the Ancient Text: Interpreting and Preaching Biblical Literature: Grand Rapids: Eerdmans. 1989. Selected “The 1990 Book of the Year” by the Journal Preaching. This is one of the most valuable contributions to preaching and honoring the gospel of Jesus Christ that I have ever read. I am a firm believer that the old testament cannot be preached alert from Jesus Christ.